1" (25.40mm) diameter base x 0.750" (19.05mm) diameter top x 0.500" (12.70mm) thick. 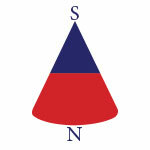 South at top, North at base. N50 Rare Earth Neodymium Cone Magnet, Nickel Plated.